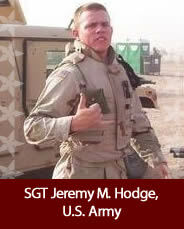 Sergeant Jeremy Michael Hodge, 20, of Rushsylvania, Ohio was tragically killed in the line of duty on Monday October 10, 2005, while proudly serving his country in Baghdad, Iraq. An Ohio National Guard Soldier of Bravo Company, 612th Engineering Battalion. Jeremy was an unselfish, hardworking leader who exemplified honor and duty. He was born July 7th, 1985 at Yakota Air Base, Japan. A 2003 graduate of Ridgemont High School where he was a member of the football and baseball teams as well as being an active participant in the show choir and theater. He will be remembered as an All-American Boy who dearly loved hunting, fishing, four-wheelers and watching NASCAR racing. His parents, three sisters, other family members, friends and even acquaintances will miss the larger than life spirit and love that he carried with him and will never forget his sacrifice that he made for our country.